Oam Thong is a modern restaurant offering Thai cuisine. The average price of a main course dish at the Oam Thong restaurant is 15 euros. The average price of a 3-course meal at the Oam Thong restaurant is 35 euros. Note that although GoMadrid.com strives to maintain all information about Oam Thong up to date, the prices mentioned are only an indication and may not reflect the exact value of your meal. 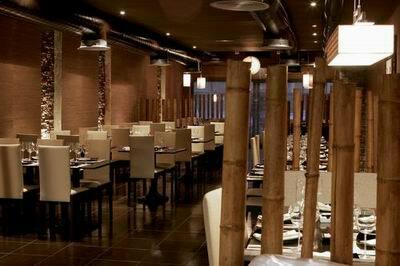 A little gem in the centre of Madrid, Oam Thong offers its guests real Thai cuisine. A stone's throw from the Puerta de America hotel you can enjoy 20 different types of authentic curry. This is a truly oriental restaurant with none of the common adaptations for European taste usually found in many Asian eateries. Whether the dish is yam nuea, a beef carpaccio salad with lemon grass, coriander and lime, a selection of Thai green curries or the potent nuea oam thong, only recommended for the very brave, you will find authentic Thai cuisine. The cuisine of Oam Thong is based on Royal Thai Cuisine. The dishes are prepared with the best fresh herbs and spices to give that authentic thai taste. Many of the herbs used are imported direct from Thailand. MAN Magazine selected Oam Thong as one of the 10 best Asian restaurants in Spain. The address of the Oam Thong restaurant is: Corazón de María 7, 28002 Madrid. The nearest Metro station is Cartagena. Please see the Oam Thong restaurant location map below.